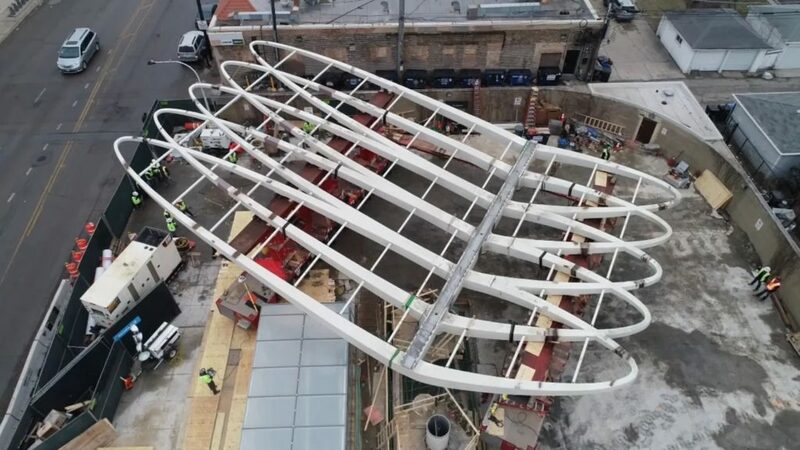 Mammoet was recently contracted to install an architectural canopy over a newly-renovated bus and subway station in Chicago Illinois. The upgrade was part of a wider subway revitalization project by Chicago Transport Authority. The 150-ton canopy was shaped like an asymmetrical butterfly, with two different arm lengths that stretched out at a 20 degree angle. 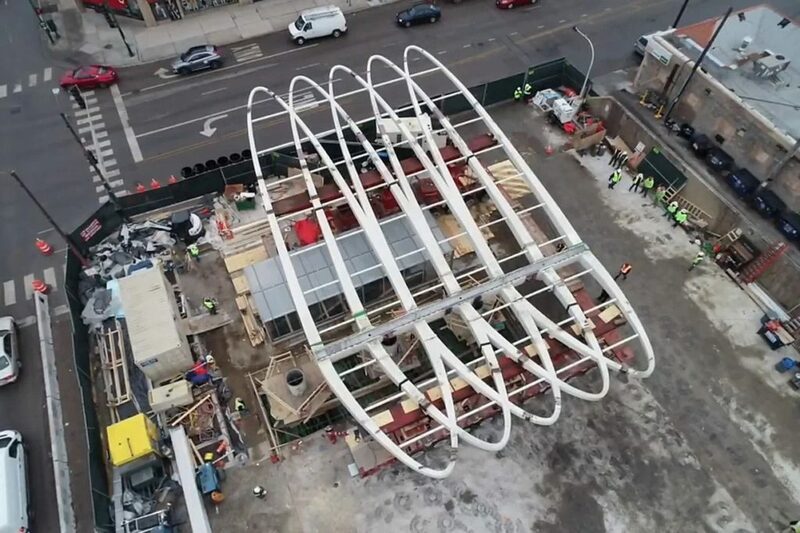 Walsh Construction was looking for a solution to install the uniquely designed canopy with as little disturbance as possible to the surrounding inner city Chicago area. The solution also needed to be executed within the small amount of space available on the construction site. A crane would have blocked the busy main road next to the site, causing disruption to traffic and the general public. So Mammoet proposed a solution using SPMTs, which would allow the project to be executed within the boundaries of the construction site and minimize any disruption or risk to the surrounding area. Working within a tight construction area, Mammoet maneuvered the architectural structure with millimeter precision to its final set position. The canopy was fully constructed onsite and needed to be relocated in one piece to its set position. Mammoet jacked the structure up a little over the height it would be installed. Then, 2 x 10 lines of SPMT were placed underneath the arms of the canopy. 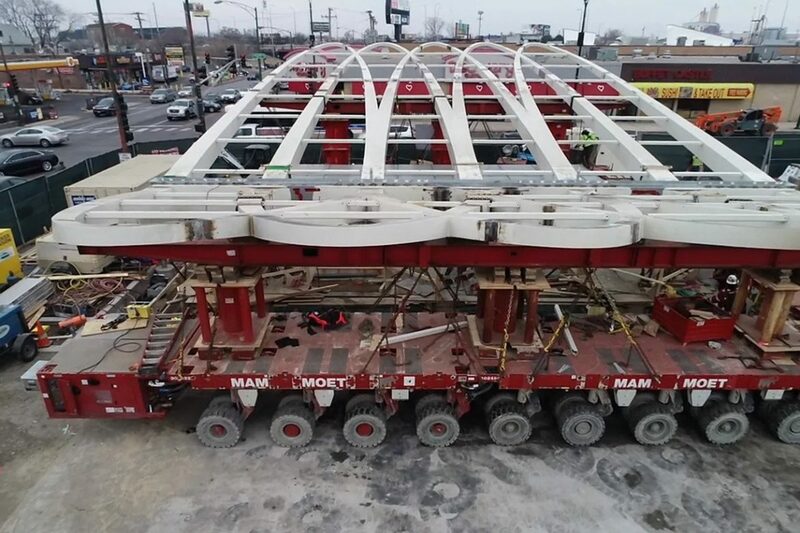 Due to the asymmetry of the structure, Mammoet had to account for different loads being pushed down onto each of the trailers. To overcome this, they programmed the two trailers so that they were hydraulically independent of each other. This meant each trailer could take a different load, but could still be controlled in synchronization by one operator. In less than an hour the canopy was set on its final resting place. With only six inches of clearance at times, the SPMTs maneuvered the canopy through the congested construction site, adapting at times to move around obstacles that weren’t on original plans. When the canopy reached its set location, the trailer’s hydraulics lowered it down into place. The reliable precision of the SPMTs combined with the skilled execution saw the canopy installed ahead of time – in less than an hour.